Nestled between the Caribbean Sea and the Atlantic Ocean, the Republic of Haiti occupies the western third of the island of Hispaniola, with the Dominican Republic on the eastern two-thirds of the island (Map 4-08). Originally inhabited by the native Taíno, Ayiti (“land of high mountains”) was introduced to European influence through periods of Spanish and French colonization from the 15th through 18th centuries. After a successful slave rebellion in 1804, Haiti became the first independent black republic in the Western Hemisphere, the first independent state in the Caribbean, and the second independent state in the Western Hemisphere after the United States. Although it was once the wealthiest French colony in the Caribbean because of its natural resources and products such as sugar, rum, coffee, cotton, wood, and lumber, Haiti has experienced considerable environmental degradation due to deforestation, poor agricultural practices, and soil erosion. It is reported to be the poorest country in the Western Hemisphere, having suffered from political and economic instability for most of its history. French and Creole are the official languages of the country. French is the principal written and administratively authorized language. It is the medium of instruction in most schools. Most (approximately 90%) of Haiti’s 10.3 million people, however, use Creole as their primary language. Because of the mix of indigenous, African, and European influences, Haiti possesses a “mosaic culture” that is reflected in local art, music, and cuisine. Once called the Pearl of the Antilles because of its natural beauty, Haiti is home to a vibrant and diverse landscape that includes beaches, waterfalls, caves, and the most mountains of any nation in the Caribbean. The people of Haiti are known for their resilience, strength, and warm and kind spirit, leaving travelers to often say after a visit to Haiti that they have fallen in love with the country and its people. Haiti has suffered significant environmental degradation, contributing to poor sanitation and water quality. As a result, various public health risks exist for Haitians and for people traveling to Haiti. All people traveling to Haiti should be up-to-date on routine vaccinations, including seasonal influenza and booster doses to protect against tetanus and diphtheria. Diphtheria is endemic in Haiti, and the number of reported cases has increased in recent years. Additionally, hepatitis A vaccine and typhoid are strongly recommended, especially if travelers are staying with friends or relatives or visiting smaller cities or rural areas. Providers should also consider administering hepatitis B vaccine. Rabies affects Haiti more than any other nation in the Americas. Prevention efforts have decreased the number of human cases of rabies transmitted by dogs, but deaths continue to be reported in Haiti. Rabies vaccination is recommended for travelers anticipating contact with animals. Yellow fever vaccination is required for people traveling from countries where the disease is endemic. Although extremely rare in travelers, cholera is a possible risk in parts of Haiti. Cholera vaccine is recommended for adult travelers visiting areas with cholera activity within the last year that are prone to recurrence of cholera epidemics. Vectorborne diseases are common in Haiti and include Plasmodium falciparum malaria, dengue, chikungunya, and Zika. Travelers to Haiti should take measures to protect themselves from mosquito bites (see Chapter 2, Protection against Mosquitoes, Ticks, & Other Arthropods). P. falciparum malaria is endemic in Haiti. The incidence of malaria in Haiti is approximately 1,278 per 100,000 people annually. Highest transmission rates are reported to occur after the rainy seasons from March through May and October through November. Travelers are advised to begin malaria prophylaxis before travel. Suggested prophylactic medications for people traveling to Haiti include atovaquone-proguanil, chloroquine, doxycycline, or mefloquine. Dengue is endemic in the Caribbean, including Haiti. Cases of dengue have been reported among military personnel and US missionaries; 240 cases were reported in 2014 alone. Chikungunya virus transmission was first reported in Haiti in May 2014, and the incidence rate is reported as 627 per 100,000 population. Local transmission of Zika virus was confirmed in January 2016. Because of the serious consequences of Zika infection during pregnancy, travelers should consult the CDC Travelers’ Health website (www.cdc.gov/travel) to obtain the most current recommendations for travel to Haiti. Travelers to Haiti will want to experience the local, flavorful cuisine, such as rice with red beans, plantains, griot (seasoned, fried pork), and a variety of fish and shellfish, including conch. While enjoying the incredible Haitian cuisine, travelers should select food and beverages carefully (see Chapter 2, Food & Water Precautions). Travelers’ diarrhea is a significant risk in Haiti, and travelers are at additional risk of contracting hepatitis A and typhoid fever. A severe cholera outbreak followed the earthquake in 2010, causing 700,000 cases of illness and 8,500 deaths that year. Incidence and mortality rates have declined each subsequent year as a result of improved access to clean water and sanitation, as well as the operations of cholera treatment centers. In 2014, there were 27,750 reported cholera cases and 296 reported deaths. Use of oral cholera vaccine has also been implemented as part of a complementary set of ongoing treatment and control measures. Travelers are urged to adhere to food and water precautions, and cholera vaccine may be considered. Leptospirosis is endemic in the Caribbean. Haiti may pose a higher risk than other areas because of recurring natural disasters such as tropical storms or flooding. Many cases have been reported in Haiti since the 2010 earthquake. The incidence of leptospirosis is highest during the rainy season. The disease can be transmitted from contact with the urine or tissues of an infected animal or with water or soil tainted by the urine of an infected animal. Travelers are advised to avoid freshwater (such as streams or lakes) that may be contaminated by animal urine. Motor vehicle crashes are the most common cause of death for healthy Americans traveling abroad. The risk of death from road injuries in Haiti is high; the 2013 rate was 945 per 100,000 population, compared with an average rate of 721 for the region. Road conditions in Haiti are significantly different from those in the United States: roads and lanes are generally unmarked, speed limits are seldom posted or adhered to, right of way is not widely observed, a variety of people and objects may appear on roads (such as carts, animals, and vendors), and roads may be unpaved or have large potholes. The main roads have been cleared of rubble from the 2010 earthquake, although some rubble remains in certain areas. Traffic is usually chaotic and congested in urban areas. Tap taps (vibrantly painted buses or pick-up trucks that serve as share taxis in Haiti but are open-air vehicles that are often overloaded with passengers and not mechanically sound) are a common form of public transportation for Haitians but are not recommended for visitors to the country because of safety concerns (such as crashes, robbery, or kidnapping). Travelers can exercise safety while traveling in Haiti by keeping alert when traveling on foot, choosing safe vehicles, and observing safety practices when operating vehicles. Travelers should fasten seat belts when riding in cars and wear a helmet when riding bicycles or motorbikes. The crime rate in Haiti is high, particularly in the capital of Port-au-Prince, which presents persistent safety concerns for travelers. Although much of the violent crime is perpetuated by Haitians on other Haitians, American citizens have also been victims of crime. Travelers arriving from US flights have been targeted for attack and robbery. Crime, disorderly conduct, and general congestion of local areas increase during Carnival. Travelers are advised to exercise caution throughout their trip including keeping valuables well hidden, ensuring possessions are not left in parked vehicles, keeping doors and windows in homes and vehicles closed and locked, avoiding nighttime travel, and remaining alert. Natural disasters common to Haiti include tropical storms, flooding, hurricanes, and earthquakes. Haiti experiences 2 rainy seasons, from April through June and from October through November. Hurricane season lasts from June through November. In 2008, Haiti experienced a series of 4 hurricanes and tropical storms within 2 months. In January 2010, Haiti experienced a 7.0 magnitude earthquake. More than 220,000 people died, and 1.5 million people were displaced from their homes. Multiple powerful aftershocks added to the widespread devastation and destruction. As a result, the health, emergency response, and safety infrastructure in the nation was significantly weakened; the country’s infrastructure remains largely underdeveloped after the earthquake. Lacreisha Ejike-King is an employee of the US Food and Drug Administration (FDA); views expressed in this chapter are those of the authors and do not necessarily reflect the official policy or position of the FDA. Brown C, Ripp J, Kazura J. Perspectives on Haiti two years after the earthquake. Am J Trop Med Hyg. 2012 Jan;86(1):5–6. CDC. Malaria in post-earthquake Haiti: CDC’s recommendations for prevention and treatment. Atlanta: CDC; 2010 [cited 2016 Sep. 23]; Available from: https://www.cdc.gov/malaria/new_info/2010/malaria_in_haiti_rec_pandt.html. CDC. Dengue virus infections among travelers returning from Haiti—Georgia and Nebraska, October 2010. MMWR Morb Mortal Wkly Rep. 2011 Jul 15;60(27):914–7. Dowell SF, Tappero JW, Frieden TR. Public health in Haiti—challenges and progress. N Engl J Med. 2011 Jan 27;364(4):300–1. Institute for Health Metrics and Evaluation. 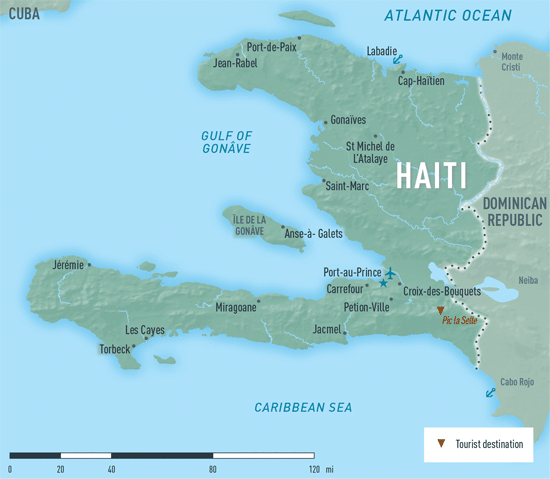 Country Profile: Haiti. IHME; [cited 2016 Mar. 10]; Available from: http://www.healthdata.org/haiti. Pan American Health Organization/World Health Organization (PAHO/WHO), Epidemiological Week/EW 52. Number of reported cases of chikungunya fever in the Americas, by country or territory 2013–2014. Washington, DC: 2014 Dec 29. Available from: http://www.paho.org/hq/index.php?option=com_topics&view=readall&cid=5927&Itemid=40931&lang=en. Pan American Health Organization/World Health Organization (PAHO/WHO), Health Information and Analysis Project (HSD/HA). Health situation in the Americas: basic indicators, 2014. Washington, DC: 2014. Available from: http://www.paho.org/hq/index.php?option=com_docman&task=doc_view&gid=27299&Itemid=721. United Nations Development Programme (UNDP) Human Development Report Office. Human development report 2013. The rise of the South: human progress in a diverse world. New York: 2013 Sep 22. Available from: http://hdr.undp.org/en/2013-report. World Food Programme [Internet]. Haiti overview. Port au Prince (Haiti): World Food Programme; c2014 [cited 2016 Sep. 23]; Available from: http://www.wfp.org/countries/haiti/overview. World Health Organization. Countries: Haiti Country Profile. WHO; [cited 2016 Sep. 23]; Available from: http://www.who.int/countries/hti/en/.